Medellín, Colombia has undergone a drastic urban transformation, and will now host the Seventh World Urban Forum. Photo by PehMed2020/Flickr. As cities in the developing world continue to grow, so do their traffic safety concerns. Latin America, for instance, now sees three times as many deaths from traffic crashes as Europe, the vast majority of which occur in cities. Vulnerable road users are particularly at risk: older pedestrians and cyclists can account for up to 45% of pedestrian fatalities and up to 70% of cyclist fatalities globally. Improving developing cities’ traffic safety is a critical task for ensuring that these growing urban centers become safe, equitable, and sustainable places to live. A key part of achieving this safety? Smart, sustainable urban design. The connection between safety and justice is a major theme of the upcoming World Urban Forum (WUF7), organized by UN-HABITAT, which this year focuses on “urban equity in development – cities for life.” At the event, EMBARQ experts will host a Cities Safer by Design for All networking session. The event will convene key experts and explore ways that urban design can improve safety – and in turn, justice – in developing cities around the world. Disadvantaged communities are disproportionately impacted by shortsighted urban design choices, whether it’s the poor – who are forced to live on the city’s periphery – or the disabled, who face mobility obstacles every day. Smart urban design principles can improve these citizens’ quality of life while also boosting a city’s overall safety. For example, implementing urban design principles like transit-oriented development (TOD) that encourage mixed commercial and residential land use, compact – as opposed to sprawled – layout, access to high-quality mass transport, and pedestrian-friendly streets is an important step towards creating livable cities for all communities. Cities built in this way provide opportunities for walking, bicycling, and using transport instead of relying on a car – an expense many cannot afford. Furthermore, promoting sustainable urban design components like bike lanes and pedestrian walkways can have significant traffic safety benefits through reducing exposure – such as by preventing the need for vehicle travel altogether – and risk – by limiting vehicle speeds and prioritizing pedestrian and bicyclist safety. Connecting urban design to safety is a concept that’s still under-utilized by most local officials and even urban planners. But some cities are beginning to emerge as leaders in this space. In order to combat its history of urban sprawl, Mexico City is enhancing its sustainable transport systems and revitalizing public spaces. The newest corridor of the Metrobús bus rapid transit (BRT) system took a complete streets approach – which aims to design streets that account for all road users – providing safe infrastructure for transport, cars, cyclists and pedestrians. One shining example of the transformation along Avenida Eduardo Molina is the city’s decision to change a dangerous and confusing intersection design that forced cars and buses to switch from the right side of the road to the left at the stoplight. EMBARQ research finds that streets with such confusing designs, called counter flow intersections, have 82 percent more severe and fatal crashes than other streets. Mexico City has also introduced new “pocket parks” or “parklets” that repurpose street space previously allotted to cars to create new public spaces for socialization and interaction. These spaces help to calm traffic, reduce street-crossing distances for pedestrians, and provide protected areas for recreation. The city has built five in the last year, and expects to build as many as 150 in the coming years. As a host to both the 2014 World Cup and the 2016 Olympic Games, Rio de Janeiro is using these mega events as a catalyst to make significant improvements to its design. One of Rio’s flagship projects is the Morar Carioca initiative, which pledges US$ 3.76 billion to improve accessibility, health, education, and the environment in the city’s favelas. With this in mind, Morar Carioca is the one of the first favela improvement initiatives in Rio to emphasize connecting these communities to the city at large via new BRT lines like the TransCarioca, which will also connect the core of the city to the Olympic Village in 2016. Systems like TransCarioca will provide vital access to jobs and opportunities in the city center and help ensure that favela residents are not cut off from the benefits or urban life. Bangalore is one of the fastest growing cities in India, with almost 10 million residents. The majority of this population relies on public transport – most notably bus and metro – for mobility, so it’s imperative that these services meet the needs of all residents. Bangalore, like many Indian cities, is also home to many making a living through the informal economy– such as street vendors and auto-rickshaw drivers – who rely on pedestrian traffic and transit hubs to make their living. While Bangalore’s bus and metro stations are hubs of economic activity, they are also currently hubs of congestion and chaos. Previous attempts to ease congestion and improve safety around these areas have privileged cars over pedestrians and transport users, and erased the informal economy, harming the city’s poorest residents. To reverse this trend, EMBARQ India is working with local authorities to make transport hubs safer for cars, cyclists, and pedestrians while retaining the vitality of the informal economic sector. New station area plans for Bangalore’s Namma Metro prioritize safe access to transport hubs and reorganize public space around these hubs. The redesigned stations promote safer links to other transport modes like auto-rickshaws and buses, provide space for vendors, and improve the quality of the public space and public transit experience for all. With the plans now under development, city officials intend to implement the new station designs over the next two years, improving accessibility and safety in some of the most crowded parts of the city. 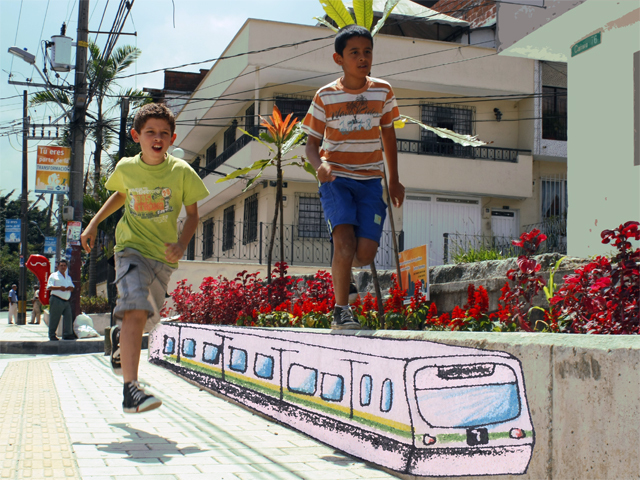 Discussions at the WUF7 can play an important role in shifting the urban design narrative. While the week long conference emphasizes civil society participation, the official dialogues will feed into the ongoing discussions of the Open Working Group on Sustainable Development Goals, clarifying issues related to urban prosperity. These include such broad topics as sustainable cities and human settlements, infrastructure, and economic growth. The WUF7 presents an opportunity for organizations from around the world to insert real examples to bring this agenda to life and explicitly tie equity to the urban development narrative. In short, the WUF7 discussions are a key way of ensuring that safe and equitable cities are a first level objective of the U.N.’s emerging SDGs, which are set to be released in 2015. Every minute of every day, new cities are being built and existing cities are constantly evolving. Smart design can help ensure that these cities are built for people – not cars.